Gu. in the dexter chief point an escutcheon ar. charged with a lion ramp. sa. Crest—A swan collared and lined ppr. There are three origin theories to this Anglo-Saxon surname. First, is a baptismal surname meaning “the son of Estmund”, mund being a corruption of the word man, or “the son of Eastmund”. It derives from the words east (meaning grace) and mund (meanding protection). The personal (first) name Estmund was listed in the Domesday Book of 1086 AD, which was a survey of England and Wales ordered by William the Conqueror. It is an Old English form of the masculine given named EsmondSecond, it is a locational surname referring to a person who came from “the East”, although Charles Wareing Bardsley, in his book A Dictionary of English and Welsh Surnames, states this theory has no evidence. Third, Mark Antony Lower, in his book Patronymica Britannica, states the name is synomous with the surname Easterling, a surname given to a person who was a naïve of the Hanse Town or of East of Germany. In medieval writings, merchants from such areas were called Mercatores Estrenses. One source asserts the family was first found in Suffolk, England, where they held lands and title in early times. Common spelling variants or names with similar etymologies include Eastmann, Eastmond, Easeman, Eastmin, Eastmen, Eestman, Eastmyn, Estman, Yeastman, Esmund, and Eastmunt. The last name Eastman ranks 2,042nd in popularity in terms in the United Status as of the 2000 Census. The name ranks particularly high in the following ten states: Vermont, South Dakota, Wyoming, Iowa, Utah, Maine, New Hampshire, Wisconsin, Minnesota, and Washington. The surname Eastman frequency/commonness ranks as follows in the British Isles: England (5,004th), Scotland (18,457th), Wales (4,622nd), Ireland (8,504th) and Northern Ireland (8,430th). In England, it ranks highest in counties Hampshire and Devon. The name is also present throughout the remainder English speaking world: Canada (2,532nd), New Zealand (9,649th), Australia (3,880th), and South Africa (11,162nd). The earliest known bearer of this surname was Ricardus filius (son of) Estmund was listed in the Pipe Rolls of Essex in 1195 AD. Stephen Estmund was recorded in the Assize Court Rolls of Buckinghamshire in 1227 AD. The Hundred Rolls of 1273 AD, a census of Wales and England, known in Latin as Rotuli Hundredorum lists four bearers of this surname, all in Cambridgeshire: Geoffrey Estmond, Cecil Estmond, Hugh Estmund, and John Estmond. A one John Estmond was documented in county Somerset in Kirby’s Quest during the reign of King Edward III of England (1327-1377). The History of Norfolk lists one John Estmond of Gressenhall. Early marriages involving this last name include Sarah Easeman to Rowland Porter at St. James Clerkenwell in 1692, Daniel Eastmond to Hannah Overton at St. George’s Hanover Square, and Elizabeth Eastman to John Tinson at St. George’s Hanover. An early baptism involving this surname was Alexander Eastman at St. Katherine’s by the Tower, London in 1686. Roger Eastman was born in England around 1511 AD and he had a son named John. This John Eastman or Estman was born in Downton, Wiltshire, around 1536 AD. He had two issue: William and Roger. His son Roger was born in the same town around 1561. He had three sons: John, William, and Roger. His son John was born in England in 1579. He married Anne Barbara Rooke and they had issue including Arthur, Roger, John, Elizabeth, and Margaret. His son Roger was born in Romsey, Southampton in 1610. He went to the United States and married Sarah Smith in 1639 in Salisbury, Massachusetts. They had the following issue: John, Nathaniel, Thomas, Timothy, Joseph, Benjamin, Sarah (French), Samuel, and Ruth. His son John was born in the same town in 164. He married twice: Hannah Healy in 1665 and Mary Boynton in 1670 and had the following issue: Hannah, John, Zachariah, Roger, Elizabeth (Brown), Thomas, and Joseph. His son John was born in the same town in 1675 and he married Huldah Kingsbury. They had the following issue: Hannah (George), Mary (Hoyt), John, Samuel, Rodger, Elizabeth Kingsbury (Flanders), Hulda (Folsom), Mehitable, David, and Tabitha. 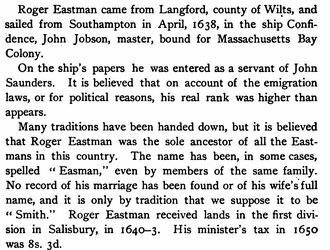 His son Rodger or Roger Eastman was born in Salisbury, MA in 1707. He married Jerusha Fitts and had four children with her: Ezekial, Daniel, Sarah, and Abigail (Webster). John Eastman’s other son was David Eastman who was born in 1720. In 1742, David married Susannah Flanders and they had the following issue: John, Huldah, Susannah, John, Kingsbury, and Sarah. Justin Maxhaur Eastman was born in East Dorset, Vermont in 1777. He married Azuba Maxim and had the following issue with her: Phoebe, David Ciprian, Asa Maxham, William Snow, Ellis Maxim, and James Justin. 1) Roger Eastman, an original proprietor, ancestor of all in the name in the land, died in 1694 at the age of 83. His widow died four years later. They had numerous children together: John (1640), Nathaniel (1643), Philip (1644), Thomas (1646), Timothy (1648), Joseph (1651), Benjamin (1653), Sarah (1655), Samuel (1657), and Ruth (1662). He likely became from Southampton, England in 1638 aboard the Confidence and came to Salisbury. Other settlers in colonial America bearing this last name include Mary Eastman (Maryland 1671), John Eastman (Massachusetts 1691), Edward Eastman (Virginia 1771), and Abel Eastman (Mississippi 1788). One of the earliest bearers in Canada was Benjamin Eastman who came to Cornwall, Ontario in 1784, as a United Empire Loyalist, a person from the American colonies who remained loyal to the British crown during the American Revolution. One of the first settlers in Australia bearing the name was John Eastman, a convict from Devon, England who came in 1831 aboard the Argyle and settled in Van Diemen’s Land (a penal colony that became Tasmania). In New Zealand, one of the earliest settlers bearing the surname was T. Eastman, who came to the city of Auckland in 1876 aboard the La Escocesa. I have not been able to identify a motto for the Eastman family. We have one coats of arms for the Eastman surname depicted here. These 8 blazons are from Bernard Burke’s book The General Armory of England, Ireland, and Scotland, which was published in 1848. The bottom of this page contains the blazons, and in many instances contains some historical, geographical, and genealogical about where coat of arms was found and who bore it. There are hundreds of notable people with the Eastman surname. This page will mention a handful. Famous people with this last name include: 1) George Eastman (1854-1932) who was an American entrepreneur who founded Eastman Kodak, known for popularizing roll film and mainstreaming the art of photography, 2) Kevin Brooks Eastman (1962) who was a comic book artist from Portland, Maine who was a co-creator of the Teenage Mutant Ninja Turtles, 3) Edward “Monk” Eastman (1875-1920) who was a gangster from New York City, 4) Rebecca Lane Hooper Eastman (1877-1037) who was an American suffragette from Walpole, New Hampshire who was an author of short stories, and 5) John H. Eastman (1861-1938) who was a businessman who served as the mayor of Shreveport, Louisiana from 1910-1914. The three main devices (symbols) in the Eastman blazon are the lion, escutcheon and swan. The two main tinctures (colors) are argent and gules.